At least 10 people have been killed, including a suspected gunman, and unidentified number of people injured in a shooting at the Olympia shopping mall in Munich, Germany. Police treat the incident as a terrorist attack. The shooting took place both inside the mall and on nearby streets, according to police and witnesses. Initial reports suggested at least three gunmen were involved and police warned that the shooters are still on the run and dangerous. Police said that they were dealing with a "shooting rampage" and suspect terrorism. Besides those killed in and around the mall, police have found a ninth body, allegedly with a self-inflicted gun wound. Authorities are “intensively examining” the body to see if it may be one of the attackers, police spokesperson Marcus Martins said. There was no immediate claim of responsibility for the shooting but Islamic State (IS, formerly ISIS/ISIL) supporters are already celebrating the incident on the social media. The attackers entered the shopping mall and randomly opened fire, injuring many people, a person Periscoping from the scene said. At least one of the shooters then reportedly left the center and headed towards a railway station. The assailant has shot people at a McDonalds located in the shopping center and at a railway station, German BR24 news reports, citing eye witnesses. Munich authorities requested assistance from an elite German counter-terrorism, hostage rescue and special operations federal police unit known as GSG9. There is a heavy police presence in the center, with authorities calling on people to avoid the area near the shopping mall. Police are also investigating reports about other shootings in the city, they said in a Twitter post, adding that the situation is still unclear and urging people to avoid public places and not to travel by subway or train. Earlier, unconfirmed reports on social media suggested further shooting took place at Karlsplatz square in central Munich, while another reportedly occurred at Isartor square, close to the city center. 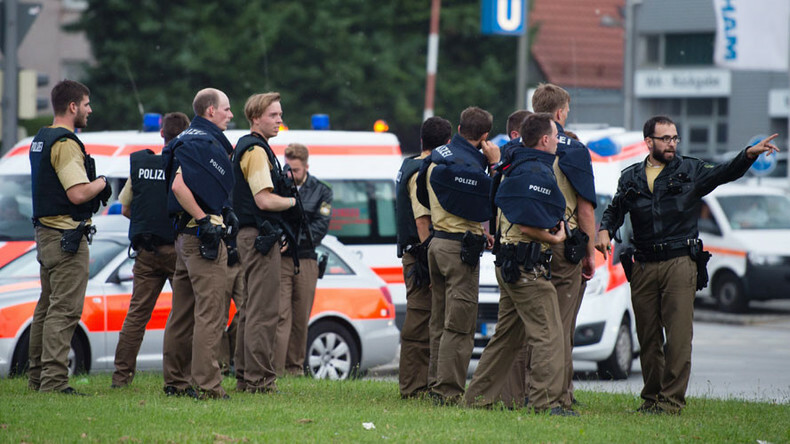 Munich authorities declared an emergency in the city following the shooting at the mall. Local residents were urged not to leave their homes via special messages sent to their smartphones by the Katwarn system. Meanwhile transport authorities say they have halted several bus, train and tram lines. Bavarian Prime Minister Horst Seehofer and Interior Minister Joachim Herrmann have formed a crisis center, while German security cabinet is set to hold a meeting on Saturday to assess the situation. If the Munich shooting was a lone wolf attack, it could have been committed with a variety of motives, ranging from deeply personal reasons to ideological. However, because it was an coordinated assault made by a group, then it was likely a terrorist act, Jonathan Steele, an international affairs commentator, told RT. “If it is just one person doing it, then [the reason for the shooting] could be any kind of a personal grudge [this person] had, or he could be a member of a far right group, or a person with a hate complex of some kind. But when several people are involved in a shooting and one has to assume it is coordinated, it is clearly a terrorist cause,” Steele said. “But we still do not know from what country these people came … whether it is connected with anything Islamic, so we have to be careful and not assume that automatically,” he added. The shooting in Munich comes a week after a teenage Afghan asylum seeker wounded five people on a train in Germany in an axe rampage. It also follows a terrorist attack in Nice, France, on Bastille Day, in which a Tunisian man drove a truck in a crowd, killing 84 people.